Pigs are models of sincerity, purity, tolerance, and honor. When you first meet them, Pigs seem too good to be true. They are careful and caring, obliging and chivalrous. Put your trust in him, he won't let you down and he will never try to. The Pigs simply want to do everything right. Pigs are the people everyone admires most. Make a list of the Pigs in your life: aren't they the nicest, most loving and scrupulously caring people around? Pigs are born to give, to yield and to serve. Frankly speaking, most people take advantage of this Pig nature. Also, not only are Pigs easy to fool, they like it that way too. No matter how old they get, Pig people still only see and believe that all men/women are basically good. Pig people constantly sacrifice their own happiness and comfort for the sake of somebody else. The Pig is a splendid companion. If you have a lifetime Pig friend, don't think that your worries are over. Pigs are loyal, faithful and giving - only as long as they approve of you. In order to keep your lifetime Piggy friend, remember, never try to force your opinions on a Pig - A Pig rarely asks for help and cannot graciously accept it. The Pig doesn't say much - but when he does decide to speak, suddenly, nothing can stop him until he runs out of subjects. Like the Monkey, the Pig is intellectual - a character with a great thirst for knowledge. Some people claim that Pigs are snobbish. Manners, breeding and good taste are of enormous importance to them. In fact, pigs are aesthetic. Pigs are born with an excellent nose for style in everything. Food is another of Piggy's little sins. Pigs adore food, and after-dinner chocolates. The Pig often over-eats, but he eats with good taste. In relationship, Pig people are sensitive, sweet but naive, and caring. They are romantic and certainly are the marriage-type. But on the other hand, Pigs are also possessive, jealous and exclusive. When encountering the Pig, we sense his or her quiet sincerity and purity. The Pig is so honest that he feels guilty for the slightest error, and he is more indulgent and forgiving of others than he is of himself. He is without artifice or pretense, and dislikes forcing himself on others or being the center of attention. Chivalrous, gallant, obliging, scrupulous to a fault, the Pig is naive, innocent, confident, and defenseless. He allows himself to be duped easily, accepts his own faults calmly, and those of others with tolerant understanding. He is incredibly sincere, almost to the point of doing himself harm, and always disarmed by the bad faith of others. He lies rarely, and then only to defend himself. Powerless against hypocrisy, he will often crucify himself in an attempt to justify his actions. He is an absolutely straight dealer and it's very rarely that he will accept a compromise. Ironically, though the Pig believes without question whatever anyone tells him, he is always finding it necessary to produce proof of what he himself asserts! People born in the Year of the Pig have a taste for la dolce vita. Possessing a strong sense of luxury, they can be extravagant and take great pleasure in pampering themselves and their loved ones; they delight in the stimulation of the senses. However, when they need to work they will get right to it. At these times a half-hearted attitude just won't do; where they're concerned, it's all or nothing. The Pig is a splendid companion, so much fun, and game for a risque evening. He doesn't say much, but when he does decide to speak, suddenly the barriers are down and nothing can stop him until the subject's exhausted. Like the Monkey, the Pig is intellectual, a character with a great thirst for knowledge. He reads a lot, but reads anything that happens to be around. Although he appears to be well read, the Pig's knowledge is only superficial. 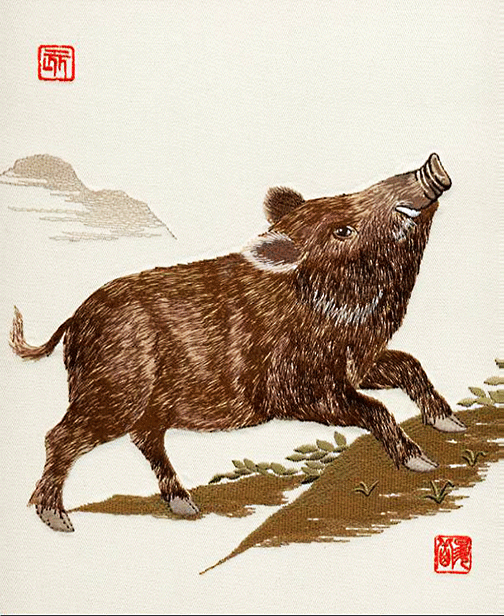 Referring to this, a Japanese proverb says that the Pig is "wide of face but narrow in the back." The Pig is sensitive, caring, and indulgent. Not only intelligent and cultured, the Pig also has a streak of bawdiness and earthiness. Their various indulgences can verge on gluttony. Unlike the conniving Machiavellian pigs of Animal Farm, Chinese Pigs tend to be helpless and insecure. During fat spells they suddenly lose all and are unable to defend themselves, much less attack others. Pigs in general are lucky but lazy. Pigs can be very practical, logical and down to earth. They may at times be considered somewhat cool and reserved because, blessed as they are with composure and self-control, they don't usually allow emotion to cloud the issue. They are cheerful and love company and social life. They find it very easy to make friends and also seem to hang on to them for life. For them the Pig is capable of the greatest sacrifices. He is extremely considerate of the chosen few who do merit his affection. The women of this sign like nothing better than to make presents for people and organize parties; they are marvelous hostesses. Whatever his ambitions may be, whatever the tasks and goals he has set himself, the Pig will do his duty with all the strength he is capable of, and that same strength can be an inner force to be reckoned with, a force that nothing can oppose. Once a Pig has come to a decision, nothing can stop him from carrying it out. But before he arrives at it, he spends ages weighing the pros and cons, which sometimes gives the impression that he is indecisive. Nothing could be further from the truth, but to make sure he is avoiding any possible complications, he will sometimes ponder for so long that he destroys his own case. Untiring workers, Pigs will succeed in their careers, especially if they are their own boss. Because they like to accumulate ancient objects and fine pictures, they might become art dealers, specializing in antiquities. Their aim is to live in relative affluence, both for themselves and their families, and to enjoy the pleasures of life. Materially, the Pig will always have all the necessities of life, regardless of his chosen career. Work and money in sufficient quantities seems to gravitate his way without his having to make any particular effort. People will help him all his life, and thanks to this help he will be able, if he wishes, to reach the highest heights in the financial world. Popular superstition in the East says that people help Pigs just to fatten him up so he will make a better meal over the New Year. Because of this, the Pig may be over-wary and trust nobody. If the Pig's birth date is a long time before the traditional feasts, he will escape a lot of the disappointments in store for him. However, the closer it is to the Asiatic New Year, the more he will be betrayed, ridiculed, duped, and perhaps in the long run, eaten! Though generally tolerant and fairly placid people, when absolutely backed into a corner, Pigs can turn vicious. When they find that their friendship and good nature have been seriously abused, they will give no quarter and that friendship will somewhat unceremoniously be cut short. Perhaps they can be accused of exhibitionism, of being flirtatious and even licentious at times, but there is no doubt that Pigs in general are very good sorts -- honest, decent, generous, supportive, loyal to their friends, and thoroughly trustworthy. The first phase of the Pig's life will be relatively calm. During the second, every conceivable conjugal problem will be visited upon him. But whatever his troubles, the Pig, discreet and shy, will never ask anybody else for help; he'll try to get out of the mess by himself. His reticence in this respect may do him harm, for nobody will even suspect the torment he's going through. Above all else, Pigs are sensual, self-indulgent creatures. They adore anything that smacks of physical pleasure, whether it is gorging themselves with sweetmeats or idling a whole day away with their newfound heart throbs between their satin sheets. Passionate by nature, some younger Pigs could tend towards promiscuity while some of the older ones could well become bawdy and lascivious. Unfortunately for them, love seems somehow to befog many a Pig; when deeply smitten, their emotions become rather transparent and they can become putty in the hands of unscrupulous types who can induce them to behave quite out of character. They may often be deceived, often disappointed, often made a fool of ... and often loved. The female Pig makes a very good mother. Pigs are loving and loyal to their mates, and caring and considerate towards those they love. In any close, intimate relationship it is friendship that the Pig will value most. Settled with the right partner, these generous, warm-hearted individuals will enjoy happy and contented lives, developing their talents within that supportive framework and devoting themselves completely to their family and their loved ones. With their simplicity of soul and their sensual appreciation of nature, the Pig always seeks the authentic and the true in personal relationships. TriStar Media Group is a multimedia organization established by Ivan Stein.